[flv:http://www.yesh.com/video/MerakiMinis2.flv 320 240] Three Meraki Minis just arrived. I’m going to place them around and see how well they work. Supposedly they’re easy to install and set up. This could be key for rapid network deployment. Man.. they are really small! More video about this project later. Note: I shot this video using my Canon Elura 100. It was recorded to a 4GB SD card. (no tape) I then uploaded it to my laptop. Trimmed it. Then converted it to an flv file. (flash video) Thanks to the FLV Embed plugin and WordPress publishing this video was pretty quick. Yashna of the Durham Literacy Center has set up a new blog for students and tutors. It’ll be an interesting read I’m sure. Its wonderful to see folks using blogs as a tool for adult education. Check out DLC Adult Literacy Community. Tonight Tomorrow night the Chapel Hill Town Council will hear a staff proposal for a WiFi pilot project. This project has been a long time coming. One of the first reasons it was proposed in 2005 was to increase equal access to the Internet for all citizens. Former Council Member Edith Wiggins made it clear that if WiFi were to be offered to any part of the community it should include Pine Knolls and Northside. Here is a video of all five locations that will be proposed. None of them are in Northside or Pine Knolls, none will be available indoors, and three of them are in parking lots. Town of Chapel Hill supports G.A.T.E. I’m really happy to see the Town of Chapel Hill promoting their opposition to HB1587. They stood up to a really bad bill in the NC House of Representatives. 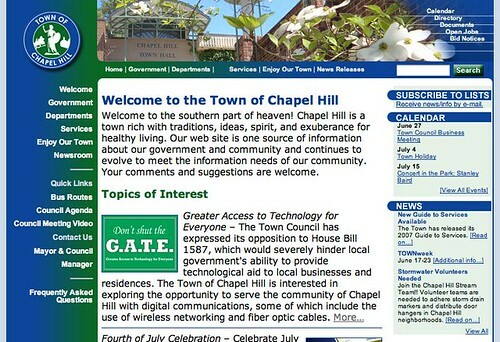 The Town of Chapel Hill passed a resolution opposing HB1587 on June 11, 2007. Here is the TOCH agenda and here is the resolution.